Oxfordshire (abbreviated Oxon) is a county in South East England bordering on Warwickshire to the north-north west, Northamptonshire to the north-north east, Buckinghamshire to the east, Berkshire to the south, Wiltshire to the south west and Gloucestershire to the west. The highest point is White Horse Hill, in the Vale of White Horse, reaching 216 metres (856 feet). Its main city is Oxford the home of the University of Oxford. Other main towns are Banbury, Bicester, Kidlington, Chipping Norton, Carterton, Witney, Thame, Chinnor, Abingdon, Wantage, Didcot, Wallingford and Henley-on-Thames. There is much to do in Oxfordshire with activities such as country walks, cycling, sailing and punting and also many places to visit such as churches, historical buildings and in the Oxfordshire Cotswolds some wonderful idyllic villages. There are many TV and film locations, you can follow in the footsteps of Harry Potter or visit the locations of Downton Abbey. Bampton doubles as the fictional village of Downton. The Swan Inn at Swinbrook, Cogges close to Witney and Shilton a picturesque village near Burford have also been used in the filming of Downton Abbey. There are a number of companies offering Downton Abbey themed tours. Wallingford is an ancient market town set on the west bank of the River Thames in the upper Thames Valley just downstream of Oxford and lies at the foot of the Chiltern Hills. It is a great place to spend a day exploring the town’s museum and antique shops, the Corn Exchange theatre, the Cholsey and Wallingford steam railway, public parks, strolling around the Castle Gardens with Red Kites flying overhead and by the River Thames on the Thames Path or searching for the remains of Wallingford’s Saxon past. Wallingford which also lies on the Thames Path and close to the Ridgeway and Swans Way is also a good destination for spending a few days to exploring the surrounding countryside and nearby places such as Oxford, Henley and Reading. Wallingford Bridge is a 900 foot long medieval stone bridge which crosses the River Thames and adjacent flood plain. The Market Place with its 17th century Town Hall, War Memorial and many shops has held a market every Friday since the granting of the Town Charter in 1115 and every Saturday morning there is a Local Producers Market. Although Wallingford is a small town there are some narrow alleyways, a number of historic inns, three ancient churches, a modern Roman Catholic Church, a Quaker Meeting House dating from 1724 and also Baptist, Methodist and community churches. It once had 14 churches. The mostly ruined Wallingford Castle was a major medieval castle situated close to the River Thames. Established in the 11th century as a motte-and-bailey design with an Anglo-Saxon burgh it became one of the most powerful royal castles of the 12th and 13th centuries. The world famous crime writer Agatha Christie lived and worked on the outskirts of Wallingford for 40 years and is buried in the neighbouring village of Cholsey. She gained inspiration from local landmarks and residents in Winterbrook, a small village at the southern end of Wallingford, for her stories such as Miss Marple. The Cholsey Agatha Christie Trail is a walk that inspired Agatha and most of her books were written in the peace of her home. Wallingford is the location of Causton, home of DCI Barnaby, in the TV series Midsomer Murders. The River Thames is the longest river in England and the second longest in the UK. The river is 215 miles in length rising at Thames Head in Gloucestershire and flows into the North Sea via the Thames Estuary. On its route the river passes through London, where it is tidal with a rise and fall of 23 feet, and flows alongside other cities and towns, including Oxford, Reading, Henley-on-Thames and Windsor. The River Thames has been a transport route for centuries and Wallingford’s growth as a town relied partly on it. Coal was supplied from North East England by coaster to London and then by barge upriver to Wallingford. In July 1866 the Wallingford and Watlington Railway was opened between Cholsey and Wallingford. Its speed and reliability enabled it to take a large amount of goods previously carried on the Thames. The railway was sold to the Great Western Railway in 1872 and became known as the Wallingford Bunk. British Railways closed the line to passengers in 1959 and to goods traffic in 1965, but the track between Hithercroft Road and Cholsey continued in use to serve the maltings, now demolished, until 1981 when British Rail removed the junction at Cholsey. The line has been preserved as the Cholsey and Wallingford Railway which is known locally as “The Bunk”. You can enjoy a five mile round trip between Cholsey and Wallingford on selected weekends and bank holidays throughout the year and when available the trains are steam hauled. The Thames Path, which opened in 1996, is a long distance walking trail following England’s best known river for 184 miles. From its source in the Cotswolds near Kemble in Gloucestershire it meanders through several rural counties and on into the heart of London. On its way the trail passes peaceful water meadows rich in wildlife, historic towns and cities and many lovely villages finishing at the Thames Barrier in Woolwich just a few miles from the sea. Several sections of the path are also open to cyclists. The Swan’s Way is a 65 mile long distance bridleway and footpath from Salcey Forest in Northamptonshire passing through Buckinghamshire to Goring-on-Thames in Oxfordshire. The way, designed for horses and their riders, crosses a wide variety of scenery from Salcey Forest then across the Ouse Valley offering fine views and passing through part of Milton Keynes. It then passes through the Vale of Aylesbury with its hilly areas of Waddesdon and Quainton before following the chalk scarp of the Chiltern Hills, with its beech woods, valleys and views down to the Thames at Goring. The Swan’s Way is also available for walkers and cyclists. For walkers the path links with the Ridgeway National Trail, the western end of the Icknield Way Path, the Ouse Valley Way and the Three Shires Way. The Ridgeway National Trail is a ridgeway or ancient trackway described as Britain’s oldest road and at least 5,000 years old. It follows a route used since prehistoric times by travellers, herdsmen and soldiers. The 87 mile long distance route passes through ancient landscapes, downland, secluded valleys and woodland. The trail starts at Overton Hill in Wiltshire on the edge of the Marlborough Downs and heads east through the Chiltern Hills to Ivinghoe Beacon in Buckinghamshire. 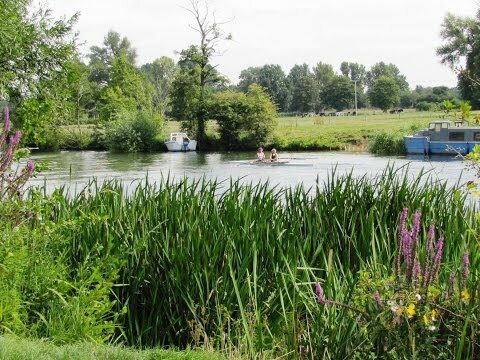 Highlights on this ancient route are a series of Iron-Age Forts the beautiful Chiltern Hills and a lovely stretch of the River Thames at Goring-on-Thames. From Wallingford Bridge next to the Riverside car park head towards the centre taking the first left down Thames Street. When we reach St Leonard’s Lane we turn left to join the Thames Path. We follow the Thames Path with the river on our left. As we approach Winterbrook Bridge we fork right to go through a gate and up to the road. We turn left to cross over the bridge then left down the slope to the subway. We turn right to go under the road signposted The Ridgeway and keep heading forward ignoring the track going off to the left. We soon pass a lake on our left then continue ahead between the hedges through the centre of the golf course. At the buildings of North Stoke we cross over a bridge and continue on the road through the village. Just after passing the telephone box we turn right at the signpost for South Stoke and Ridgeway onto Church Lane. At the lane end we pass through the churchyard to the right of the church to go through the gate and continue on the path with the river on our right. When we come to a track we turn left and follow the lane which bears left to a minor road. We turn right following the road until we come to the main road. We cross straight over onto the Swan’s Way and head towards the trees. We follow the track to the left of the trees and pass an old farm on the left. We keep heading forward uphill then as we head downhill towards the road we turn left at a post with arrows on it. We make our way across the field to the end of the hedge and the signpost on the right at the main road. We cross straight over the road and head towards the trees to the left of the farm. We go straight through the trees to cross over the minor road and keep heading forward on the track between the hedges. We cross over a second minor road and follow the hedge line on our left through the fields. We come out at a t-junction and cross straight over. We follow the lane past some houses called Forest Row and keep ahead until we come to the Ridgeway National Trail notice board and turn left. We now follow the Ridgeway crossing over a minor road until we reach the main road. We turn slightly right then cross over the road to continue on the Ridgeway. When we reach the cross roads of tracks we turn right to go under the road again and keep heading forwards towards Wallingford. When we come to Newnham Farm we turn left through the gate then immediate right by the side of the farm following the arrow on the post to go through a gate into the field. We then turn left across the field to pick up the path at the side of River Thames. We now follow the path with the river on our left back to Wallingford Bridge. This is an easy mainly flat walk with a few gentle slopes on paths, tracks and through arable and pasture land. Elevation: approx lowest point 42.30m (138.78ft) approx highest point 97.60m (320.21ft) approx ascent 111.10m (364.50ft). Approx 9.6 miles allow 3½ – 4 hours using OS Explorer Map 171, Chiltern Hills West, Henley-on-Thames & Wallingford. This walk is done anti-clockwise. Start point: Wallingford Bridge next to the Riverside car park. Wallingford is in Southern Oxfordshire. From the M40 take junction 7 onto the A392 south. At Shillingford take the first exit at the roundabout onto the A4074. At the second roundabout take the third exit. Cross the bridge over the River Thames into Wallingford. From the M4 take junction 12 onto the A4 towards Newbury. At Theale turn right onto the A340. At Whitchurch take the A329 towards Winterbrook and Wallingford. At the roundabout where it meets A4130 take the second exit to pass through Winterbrook and into Wallingford. Parking: There are seven car parks in Wallingford to choose from. Thames Street, St Georges Road, Goldsmiths Lane, Cattlemarket in Wood Street, Castle Street and the Riverside car park are all chargeable car parks. High Street is free and the Riverside car park is free in winter from 1st November to 31st February. There are free public toilets at the Cattlemarket and Riverside car parks and a superloo just off High Street costing 10p. For refreshments there are shops, bakeries, cafes, pubs and restaurants.